May 20, 5 pm EDT Update: The additional 0.19" at Buffalo today brings the monthly total to 5.23", which is over 250% of normal. The seasonal record is extended to 15.55". Burlington's 0.39" so far today raises the May total to 5.09" and extends the spring record to 16.36". 1:40 am EDT Update: Burlington received another 0.22" of rain on Thursday, bringing the month to date total to 4.70" and extending the season to date record to 15.97". Although persistent heavy rainfall in the Ohio Valley has gotten most of the attention, since it feeds into the record flooding of the Mississippi River, excessive precipitation has extended well into the Northeast. Portions of northern Pennsylvania, northeastern New York, and northern Vermont have experienced over 300% of average rainfall in the last 30 days. With nearly 2 full weeks remaining in meteorological spring (March-April-May), some major reporting stations have had their wettest spring on record. The final total for the day was 1.14", which broke the daily record of 0.99" in 1904. That was the second daily rainfall record this week, following the 1.33" on Sunday, May 15, which broke the record of 1.31" set in 1886. Burlington records extend back to 1884. At Syracuse, the 8.53" in April was a new record for the month in a climate history which began in 1902. 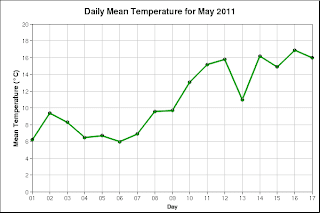 This immediately follows the driest April on record in 2010. May 20 Update: Dr. Gerry Bell, NOAA's lead seaosnal hurricane forecaster, conducted an online chat at USA Today's Science Fair blog this afernoon. As this video from CNBC at 11:45 shows, Mr. Market couldn't care less. "Til it happens, we're just going to play it by ear", said a veteran trader. Note that the horizontal scale covers just a little over 2 and a half hours. The offering price for LinkedIn was $45. This is for a company which has no earnings and revenues which are about 1/30 of the IPO offering price. The Colbert Report has the full details on South Carolina commemorating the 150th anniversary of the War of Yankee Aggression by standing up for the right to incandescent light. South Carolina has proven it "knows how to run a black market." CNBC reported this morning (click image to view video) that massive wildfires in Alberta, Canada, fueled by high winds and very dry conditions, have forced some oil operations in the province to shut down. The fires, which at the peak numbered over 100, have burned entire towns to the ground. The town of Slave Lake, population 7000, has been one-third destroyed, with all residents evacuated. The government reported on Wednesday that 87 fires were still burning, with 23 out of control, including the one in Slave Lake. 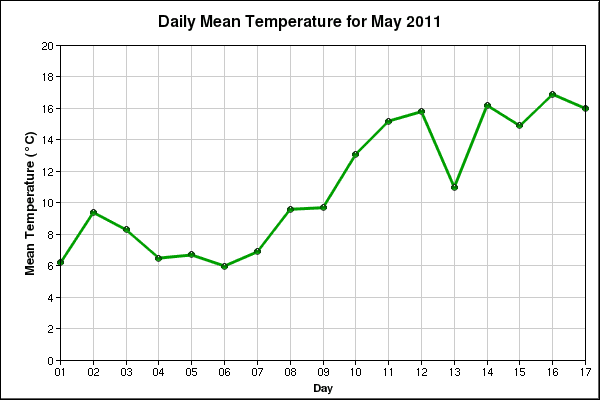 Slave Lake temperatures in the past week have been well above the May average of 9.7°C. The May total precipitation to date of 4.5 mm. is barely over 10% of the normal monthly total of 40.9 mm. ; no more than 1 mm. has fallen on any individual day this month. More videos and images at Alberta News.